When Formula One's Juan Pablo Montoya and NASCAR's Jeff Gordon famously swapped cars in a 2003 speed demonstration at the Indianapolis Motor Speedway, Robert Wickens and James Hinchcliffe were paying close attention. So much so that the Ontario-born pair, who became fast friends while on the same go-karting team a year or two earlier, decided they would try to pull off the same stunt one day. And they did last year, with Wickens taking the wheel of a Schmidt Peterson Motorsports IndyCar at the Sebring International Raceway and Hinchcliffe driving a Mercedes DTM coupe Autodromo Vallelunga in Italy. Wickens, from Guelph, left the German DTM series after six seasons — during which he put together six wins and 15 podium finishes — and 12 in total in Europe, to join Oakville's Hinchcliffe at SPM and form the "Eh Team" this year. 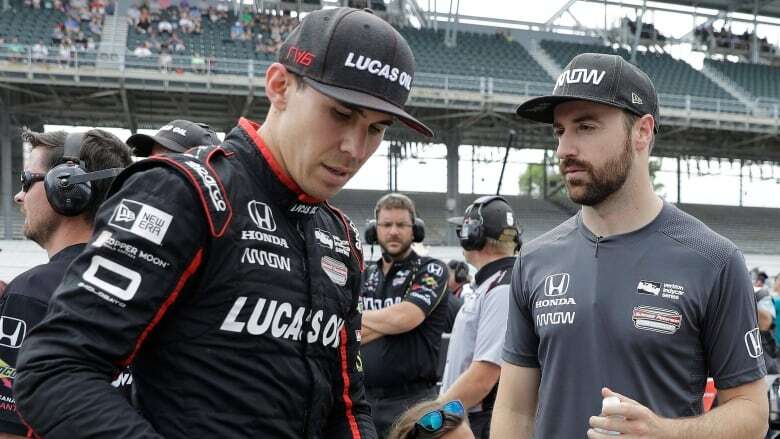 "We just wanted to both race in IndyCar, to be honest," said Wickens, admitting that he never put down his roots full-time in Europe and the constant travel across the Atlantic was taking its toll. "For sure we wanted to be teammates, because we knew we'd really be good teammates together. But we both just wanted me to be in IndyCar, and luckily we got our dream scenario and we were able to race with Schmidt Peterson Motorsports as teammates together." So far the move has paid off for the 29-year-old Wickens. He heads into his hometown race at this weekend's Toronto Indy in sixth in the IndyCar points standings, two spots ahead of Hinchcliffe. He has also put up five top-five finishes, eight top-10s and was named rookie of the year at the Indy 500 after taking ninth place. Despite it being his first season in open-wheel racing since 2011, Wickens is quick to dismiss his new-kid-on-the-track status. "I'm claimed as a rookie. I definitely don't feel like I'm a rookie. I don't look at the rookie championship. Not to be rude, I couldn't care less about it," he said. "I'm here to win races and hopefully win championships one day." Despite racing against each other, Wickens said being teammates with Hinchcliffe has proved to be mutually beneficial. "There's a corner he'll take that might be better than me, [or] one that I'm doing that's better than him, then we'll reconvene after the session talk," said Wickens. "And we're both good enough drivers that we can learn what the other person is doing and be better." Before joining forces this season, the two managed to maintain their friendship over the course of nearly two decades by keeping tabs on each other's performances and talking on a weekly basis, even when living on opposite sides of the Atlantic. "We've always had such a friendly, competition-based relationship. It's always been that, 'anything you can do, I can do better,"' said Wickens. Both racers will be looking to become only the second Canadian to win in Toronto. Paul Tracy did it in 1993 and 2003. Tracy said in a phone interview on Monday that Wickens has performed well in races similar to Toronto earlier this season. Wickens won the pole the Grand Prix of St. Petersburg in Florida and led for 69 laps, but finished fifth after a collision with Alexander Rossi. "It's not going to be easy but Wickens has been super fast on street tracks courses all year," Tracy said, "so he's got a good shot." Wickens, who hasn't raced in Canada since competing in Toronto as part of the 2007 Champ Car Atlantic, would love for his first IndyCar win to come in front of family and friends this weekend, including some who rented a school bus to travel to the race. "That would be the dream," said Wickens.